A couple of weeks ago Lowen and I decided to take advantage of the beautiful colors and warm weather and go out to Kananaskis to see the sights and take some pictures. After we took the turn off to Kananaskis we realized that the majority of the trees were coniferous and weren't changing colors. But we still found a few yellow and red trees and had a good time. Then a few days later we went out on a Sunday afternoon with our bikes. 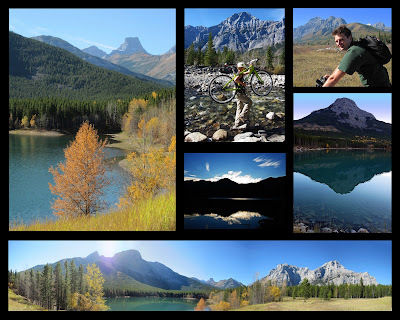 We rode our bikes from close to the Kananaskis Village to a little pond. Click here for the entire album.